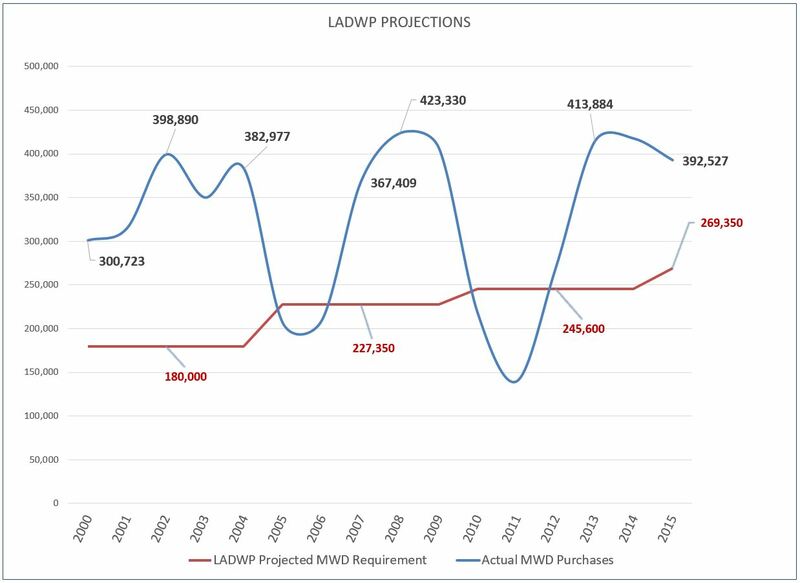 Water supply assessments for two large projects have been approved by the LADWP water resource planners and is coming to the City of Los Angeles Board of Water and Power Commissioners on June 2 for approval. 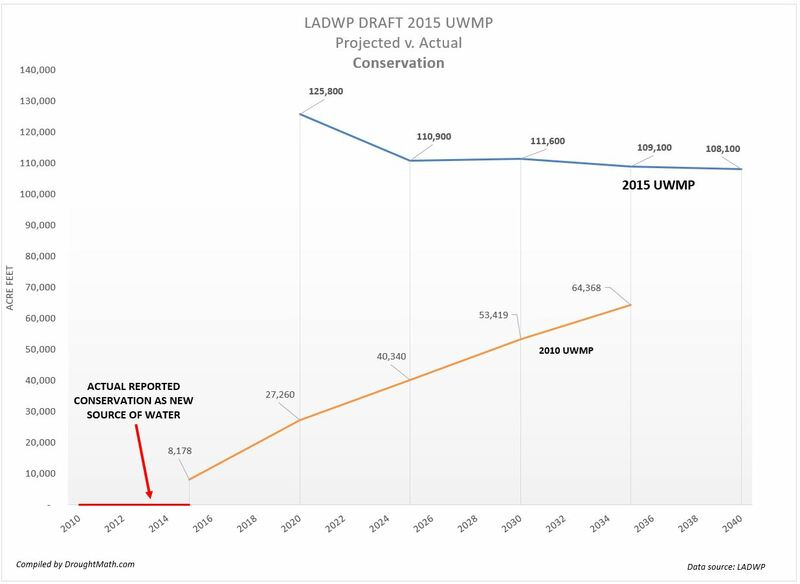 The LADWP cites its own 2010 UWMP claiming there is sufficient water for these two projects through the year 2035, and enough for all other "existing and planned future demands". 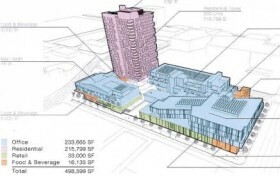 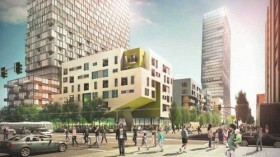 The two projects that apparently passed muster are the 250 unit Academy Square Project in Hollywood and the 1,444 unit South Los Angeles Village Project in downtown Los Angeles. 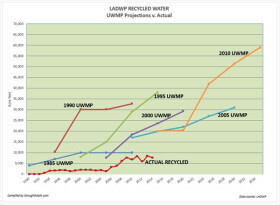 The 2010 UWMP they cite projected that the city would be receiving a yearly annual total supply of 614,800 Af/y by 2015. That would be made up with 252,000 Af/y of LA Aqueduct supply, 40,000 Af/y of ground water and 20,000 Af/y of recycled water. 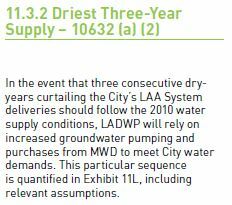 Given the bad news the entire state has been dealt with over the last three years and the city is begging residents to rip out turf in an effort to conserve, it would be understandable if you thought that the city wasn't quite meeting its water supply targets. 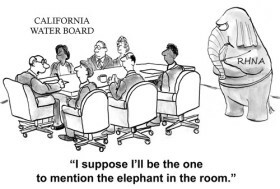 You would of course be right to think that. 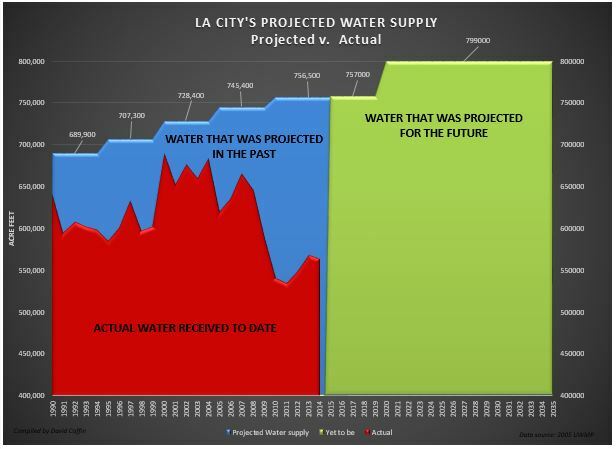 The problem with the assessments for these projects is that since the approval of the 2010 water plan, the DWP's total water supply has averaged just 550,887 Af/y which 10% a year short of what it needs to meet the city's needs. 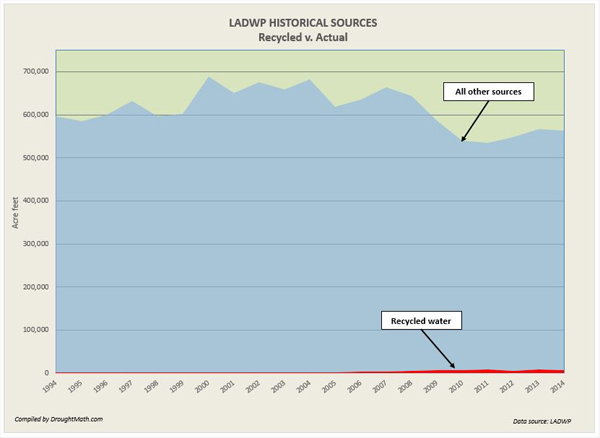 When we look at the categories that make up the supply we find that the recycled water supply is short of its 20,000 Af/y by 84% at just 7,392 Af/y. 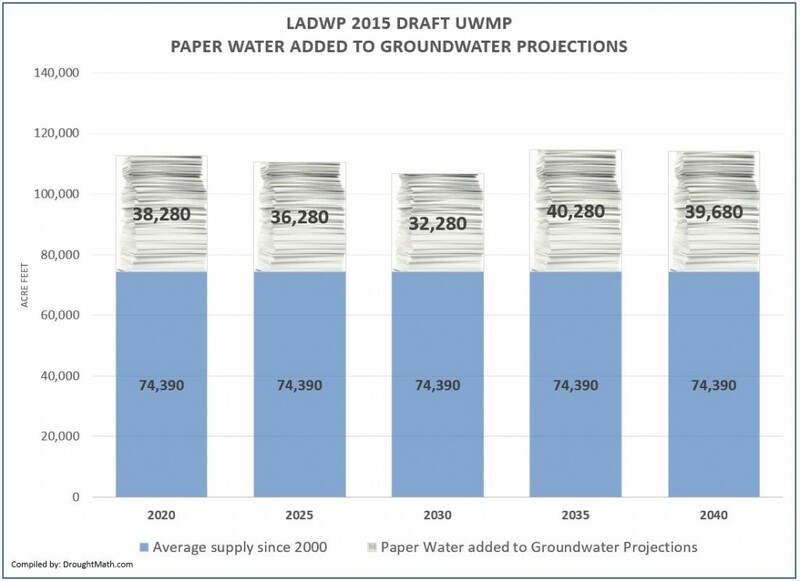 Groundwater to date is ahead of the 2010 projection by 60% but is unlikely to meet 2020 through 2035 annual projections due to its cyclical nature. 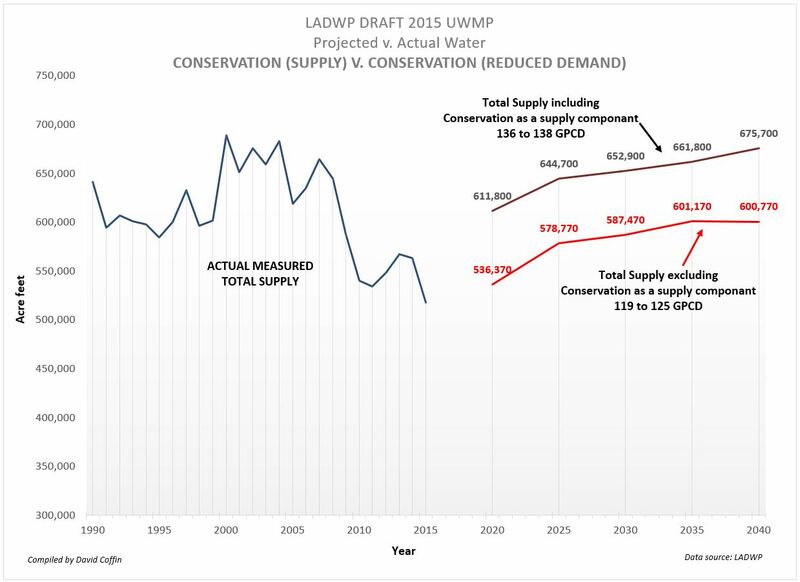 The 2010 UWMP plan also cites 40,000 Af/y of transfers for which there is no evidence of receiving and it counts 14,180 Af/y of 'conservation' as new water which it is not. 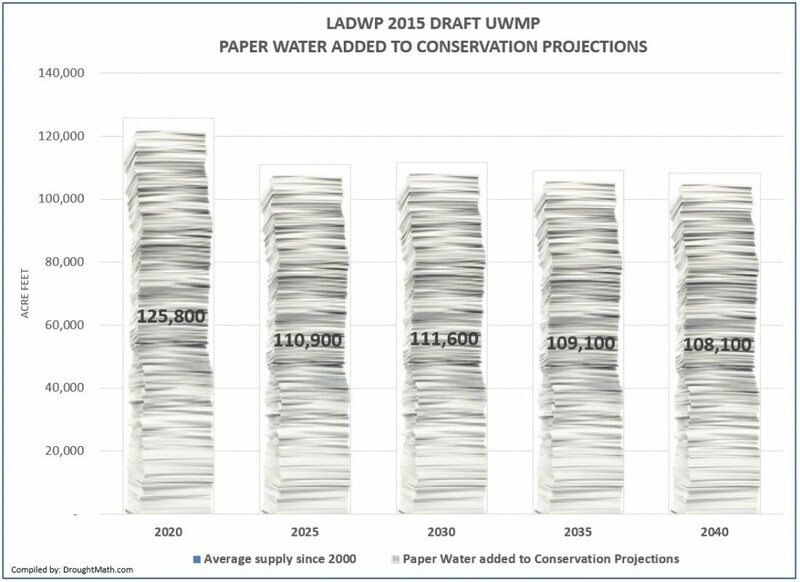 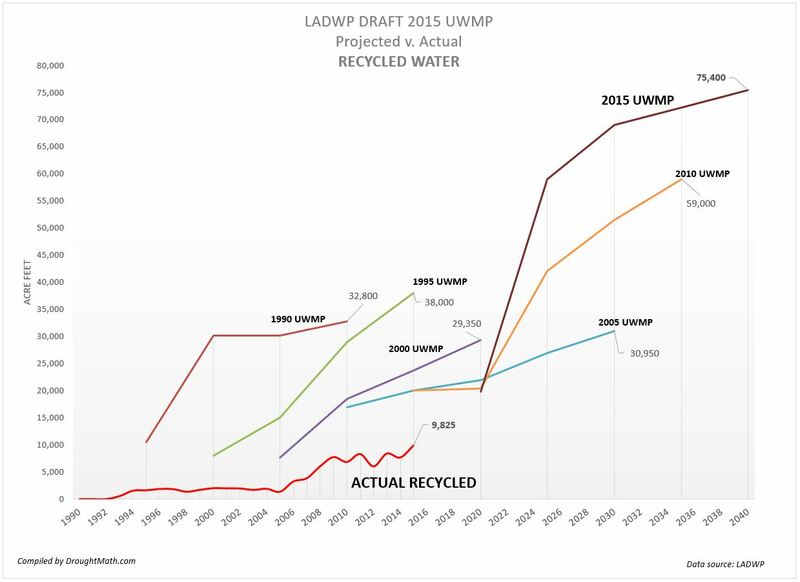 The 2010 UWMP is stuffed full of water that simply can't be accessed and is plainly 'paper water'. How the Board of Water and Power Commissioners can approve these projects with a straight face given the severity of the drought is anyone's guess. 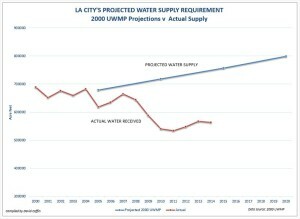 The city appears to be in a 'state of denial' when it comes to the shortage as it approves these projects big and small. 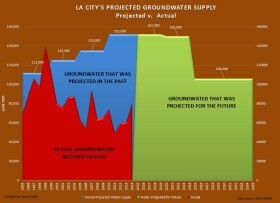 But it's also in a 'state of crisis' when it comes to prodding the public into conserving. It can't have it both ways. 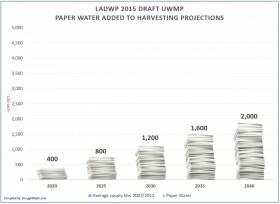 Editors note: The DWP has not met any long term water projections outlined it its plans since 1990. 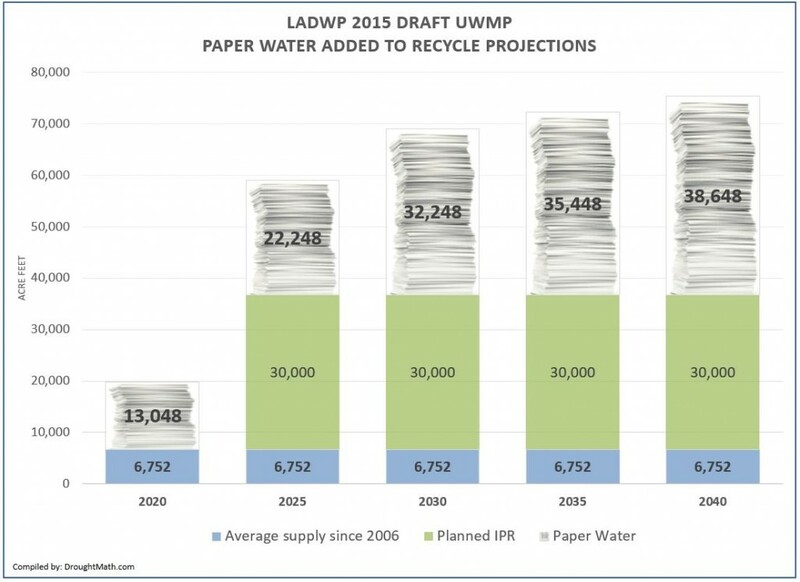 One prominent member of the City of Los Angeles's 'paper water' portfolio is recycled water. 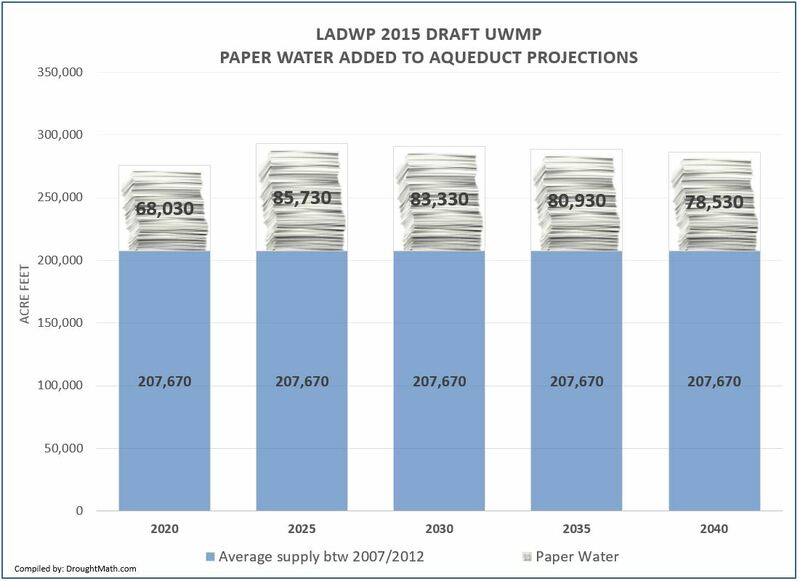 Like L.A.'s groundwater supply, its Urban Water Management Plans between 1990 and 2005 had projected rapidly growing recycled water supplies that would never be realized. 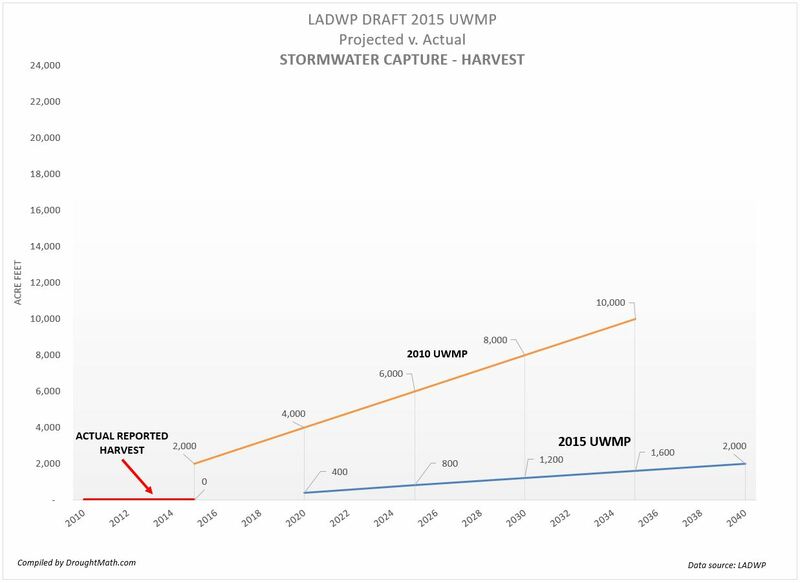 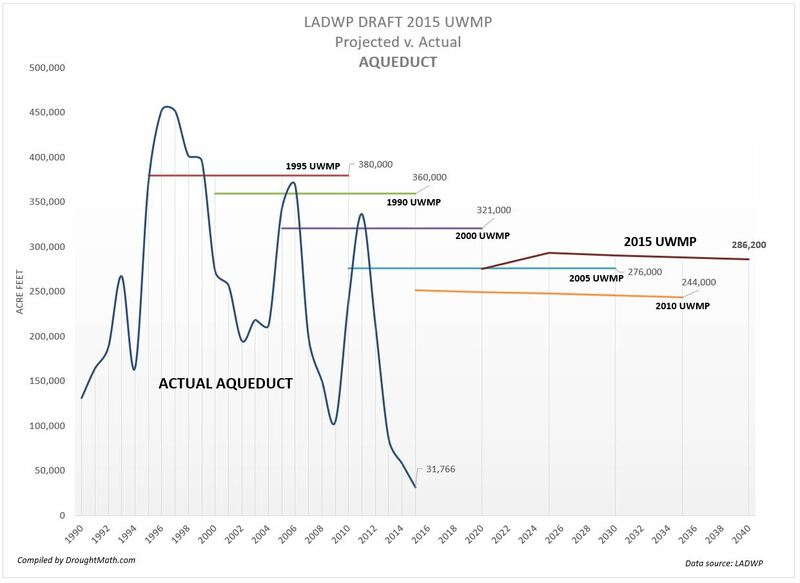 The chart at the right plots the huge gap between the actual recycled water supply the city had access to and the anticipated supplies that each UWMP projected. 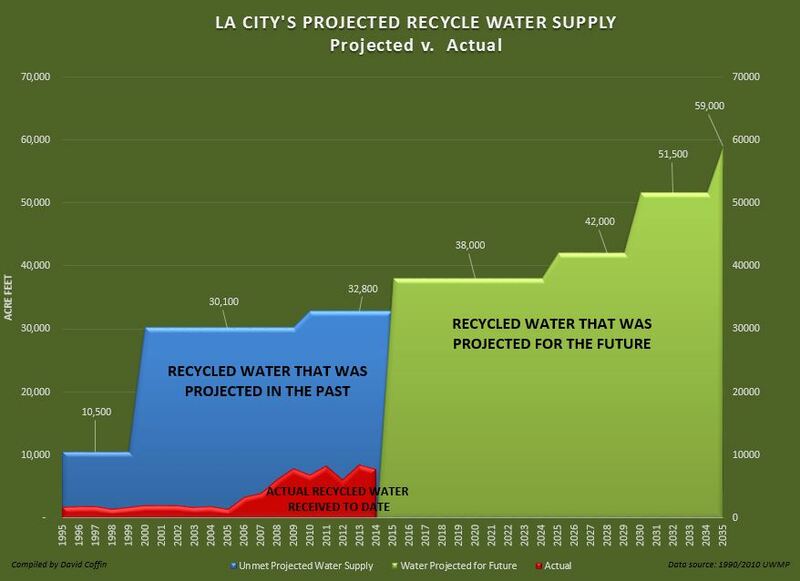 The gap between the two is the paper water that would be used to as evidence that medium and high density projects going through the planning process would have sufficient water when in fact they didn't. 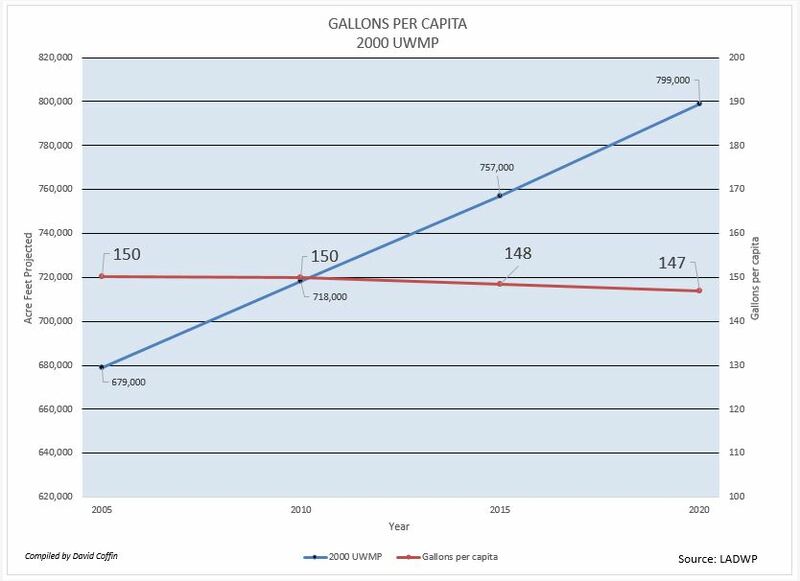 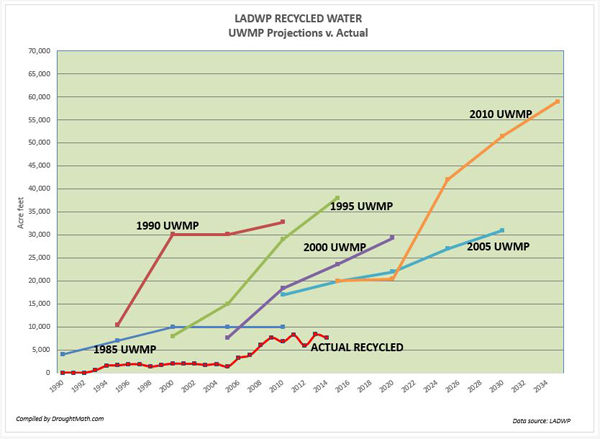 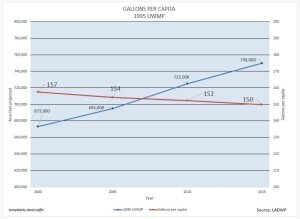 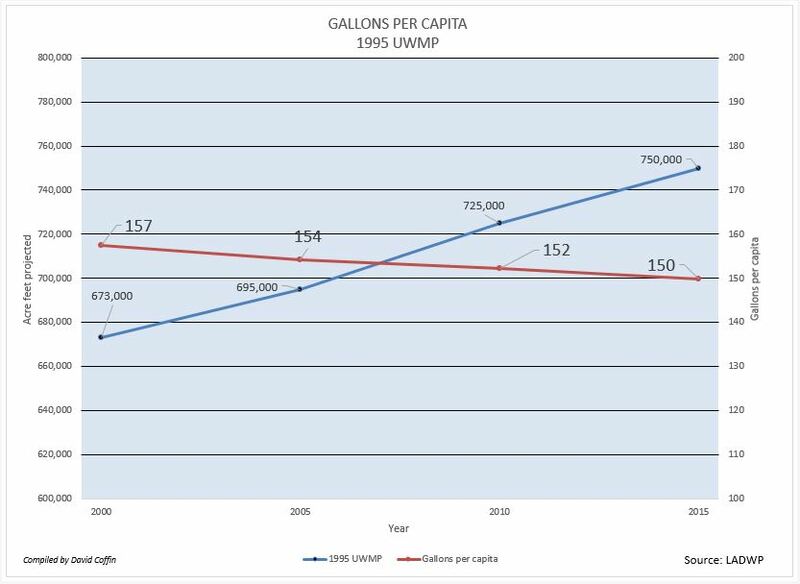 For example when we look at the 1990 UWMP projections, the city expected that its program for recycle water supply would triple within 5 years and eventually provide the city with over 30,000 af/y in 2000. 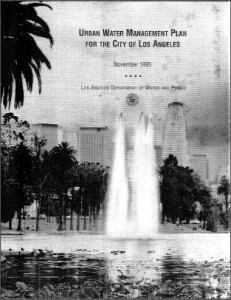 This never happened. 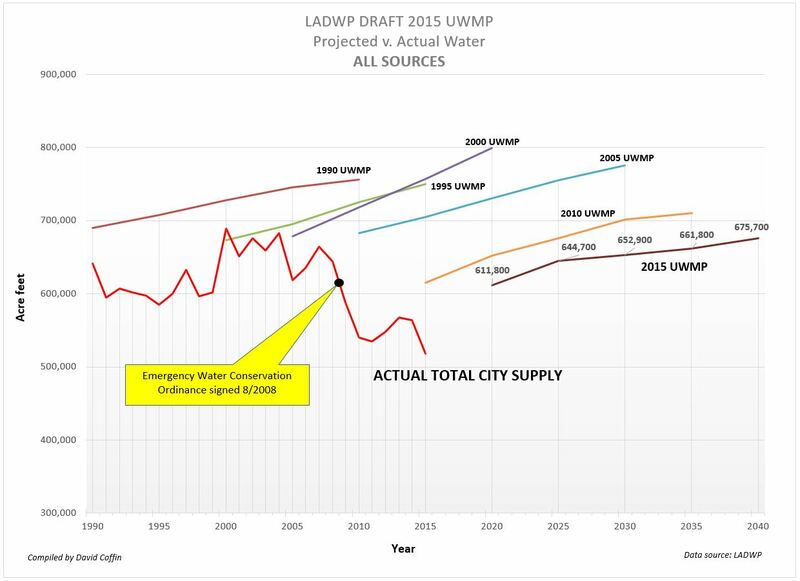 When the following 1995 UWMP came out it didn't begin where the 1990 plan left off. 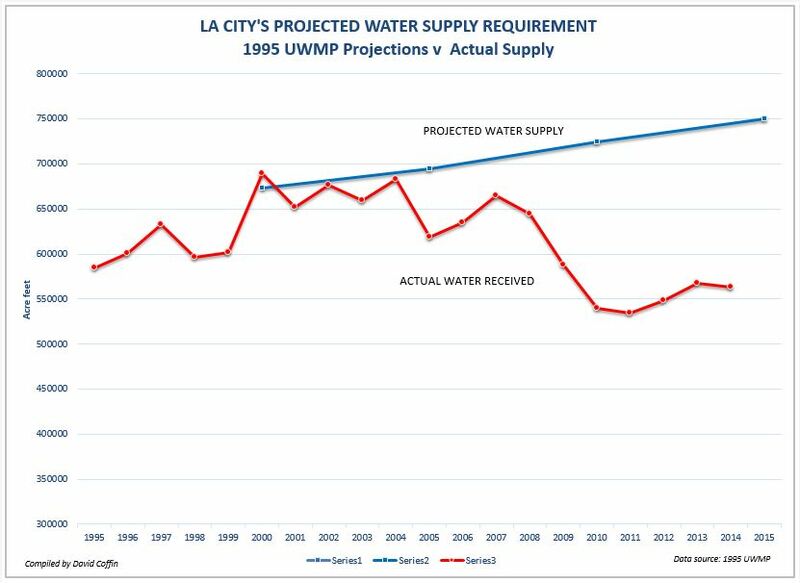 If fact it would cite less water in 2000 than the '90 plan which suggests that the effort to increase recycled water was making no progress. 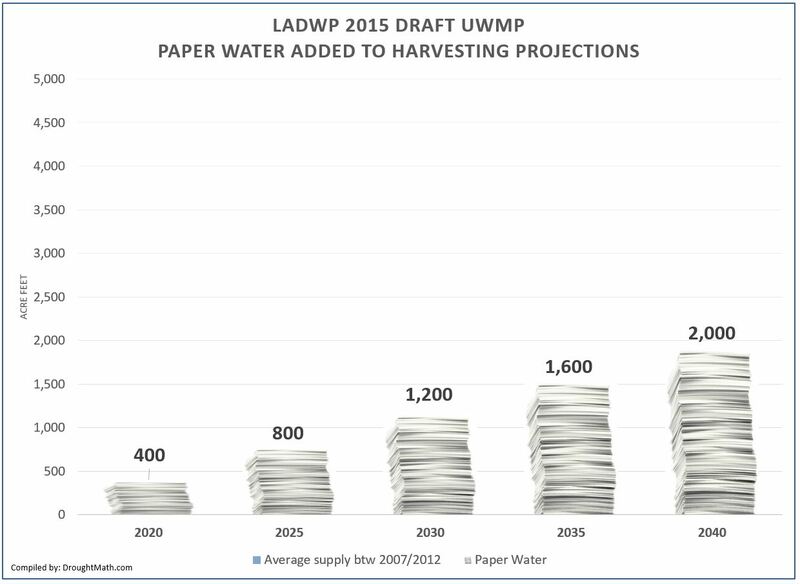 Of course paper water being what it is, that plan would still suggest (with no factual basis) that recycled water would still triple, this time within 10 years and then more than quadruple to 38,000 af/y within 15 years. 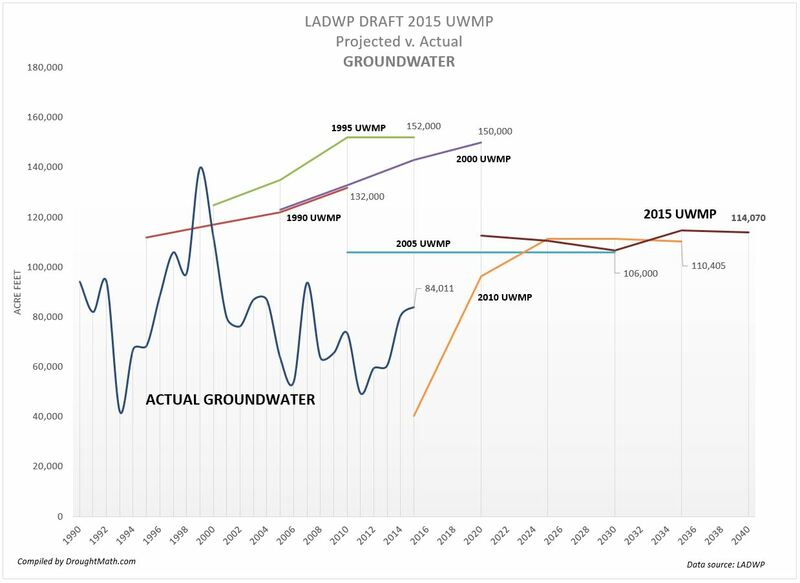 The next 2000 UWMP was no different, it would also start off with less water than the preceding plans had projected and then nearly quadruple within 15 years with supplies approaching 30,000 af/y. 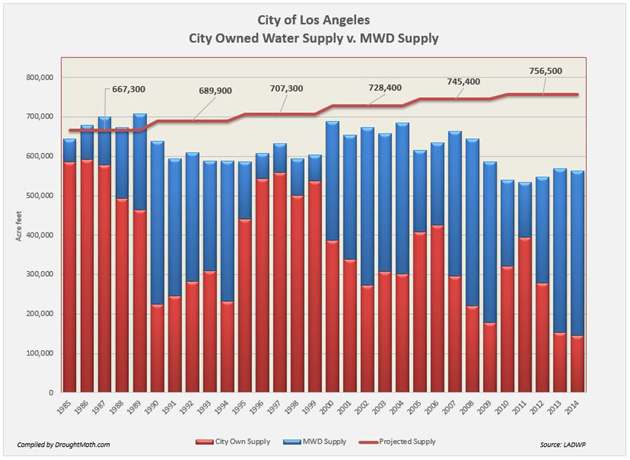 Little progress meeting past targets The actual supply between 1985 and 2010 hasn't been nearly so grand as the city's expectations and glossy presentations that suggested that recycled water would help the city meet its needs. The actual recycle water supply between 1995 and 2005 was so tiny at just 1,748 af/y and was barely perceptible on a chart. Between 2006 and 2014 the city's recycle supply would grow to just 6,410 af/y which is far below any of the past UWMP projections that ranged from 19,950 af/y to 38,000 af/y and light years behind the projected 850% increase now cited in the 2010 UWMP to 59,000 af/y by 2035. 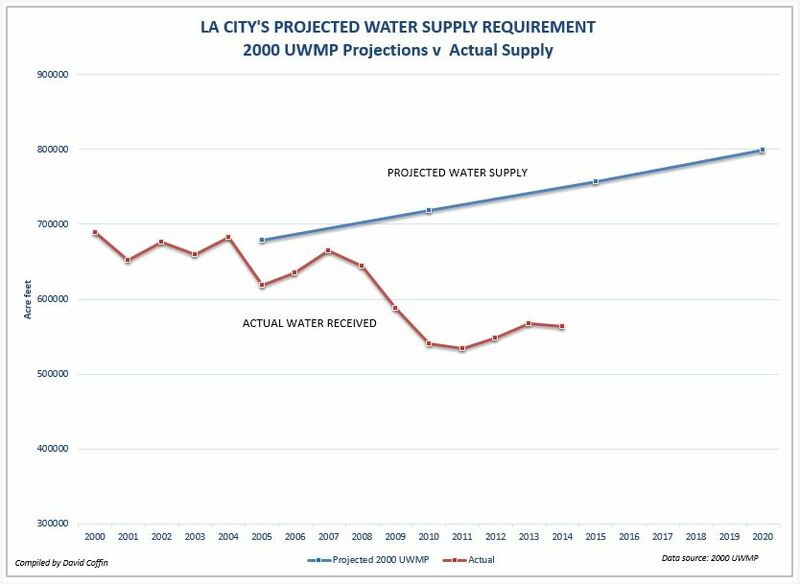 This huge gap between 'projected or anticipated supply' and 'actual supply' is an unfortunate characteristic of the city's water supply we would call paper water. It's a promise spanning 5 water plans and 25 years that was used to mischaracterize the city's supply to approve high density development. 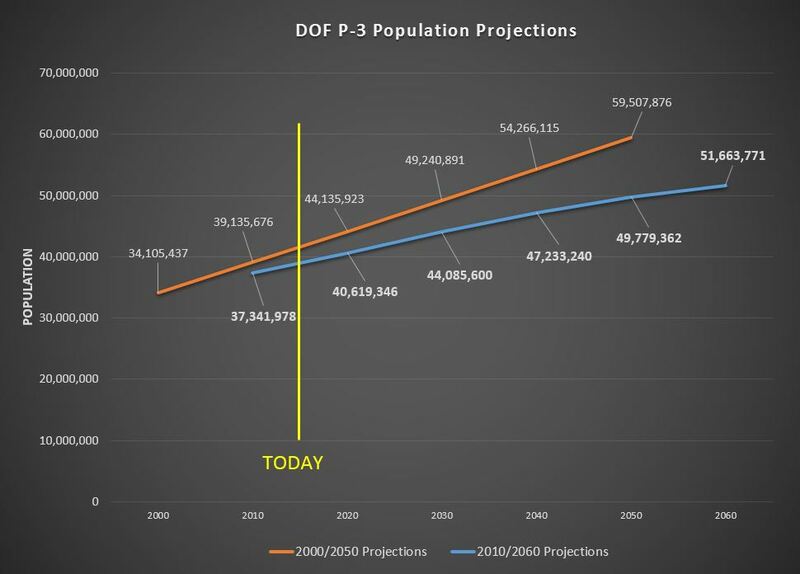 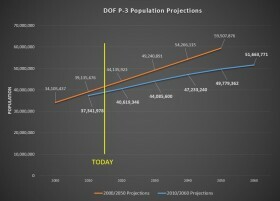 The gap has only widen between 1990 and 2015 and given the city's history of meeting its projections, I don't have much faith that it will meet the 59,000 af/y target it has set for 2035. 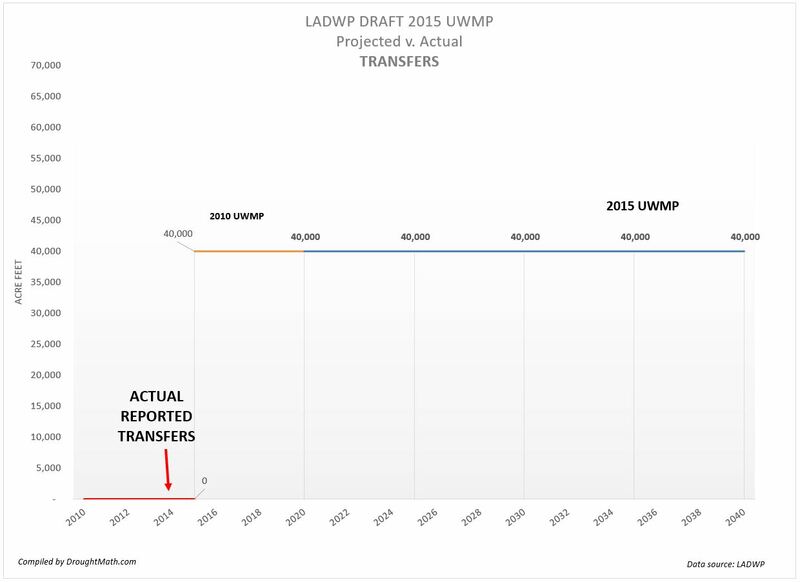 If it could have met the much lower targets it had set in earlier plans, it would have done so by now. 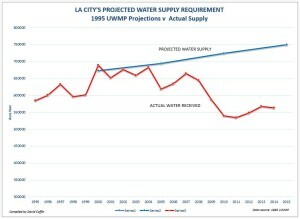 However the obstacles such as trying to roll out a citywide network of purple pipe were just to huge to overcome.